What are Takadanobaba & Shinjuku like? Takadanobaba & Shinjuku are Japan's number one student area! There are not only a lot of recreational facilities and restaurants, but also rivers and parks where you can walk and relax. 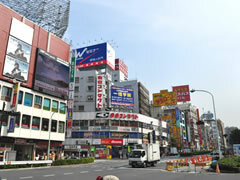 Located near Shibuya and Ikebukuro, it's a very convenient place to live! Please choose Takadanobaba & Shinjuku for the location of your school. Takadanobaba is the place where students meet! Please enjoy your student life in Takadanobaba. The best meeting place in Takadanobaba is the Big Box! There is a Uniqlo and a variety of accessory shops, as well as plenty of games, billiards, and bowling for you to amuse yourselves! This ramen restaurant was voted the best ramen shop in Shinjuku by the Fuji TV program "VVV6 Tokyo V-chelin 2" in May, 2008. We recommend that you try the prawn soup as well! If you walk towards Waseda, you can see the cherry blossoms blooming in spring and the leaves of the trees turning red in autumn. Walking by the riverside is refreshing. At this cinema, you can see two movies back-to-back at one low price. The student price for two films is only 1,100 yen, whether they be movies you didn't get to see or classic masterpieces. Make sure you check the theatre times regularly!